Join this webinar to explore the evolution of the managed security conversations moving from “Product Focus” to today’s focus of Service Based offerings. As the conversation develops we’ll discuss the strategic value MSPs are bringing to organizations and Building the Outcomes that address the business needs. Intel Security’s MSSP team is aligning our technical enablement tools to support this evolution. We’ll review the development of our Service catalog documentation and the Intel Security Solution Center, an online platform for solution demonstration and validation. The Intel Security Partner Managed Services Specialization continues to evolve to bring you best in class security solutions and enablement tools. We are pleased to introduce a New online reporting tool for Intel Security MSP consumption and usage based transactions. We are currently in pilot with a few distribution partners and will roll out by geography in the coming months. Access to the tool will be via the Intel Security Partner Portal, please ensure your reporting contact has login capacity. Join this webinar for a quick update of why we are moving to this new online platform followed by a detailed overview of how the tool works, your dashboard view and where to go for additional help. The Managed Security Service Provider can’t afford to wait months for their data protection solution to start to do its job for the end customer. Every minute their data is unprotected is another minute that the reputation of their business and the safety of their customers’ information is at risk. Some solutions require lengthy and complex deployments that demand highly specialized skills to build, tweak, and tune. Heavy deployment costs can double the acquisition price and prolong risk that can wreak untold damage. McAfee Network DLP breaks this impasse. The solution is up and running as quickly as you can plug it in. Within a week, the system gathers a wealth of information about your data use, allowing your customer to start building effective policies that immediately deliver value. As an important component of the Intel Security approach to simplifying the threat defense lifecycle, we offer the flexibility to Managed Service Providers when it comes to Network DLP service management options. These include customer on-premises, data center, or cloud-hosted offerings. Join this webinar to review the solution architecture document created for your reference as you explore these options within your organization. Intel Security is focused on helping organizations tackle their most pressing security challenges so they can realize the possibilities of a safe and connected world. As announced at FOCUS 15, we are working to create an integrated system that delivers faster protection, detection, and correction. Intel Security is proud to present a webcast on Web Protection, Web Gateway and SaaS Web Protection. We will cover topics such as Anti-malware protection, Web filtering, Basic architecture, deployment options, application visibility and product demo. Endpoint encryption is an essential part of protecting business data. Intel Security now has three data protection solutions available. Join this webcast to learn How to Sell Data Protection from Intel Security; by explaining the 3 offerings, which customer use cases fit each solution, and how to sell. Plus awareness of new Capabilities for Q4 2015 and 2016. The Intel Security Partner Managed Services Specialization continues to evolve to bring you best in class security solutions and enablement tools, and now with even greater flexibility in how to procure them. Join this webinar for a quick update on the addition of upfront purchase/ perpetual SKUs to the MSP Price book followed by a detailed overview of the newly available technical enablement tools to help you extend your business model from pure resale to services. We will review a partner technical self-assessment work sheet to help determine what may be needed within your organization, technology portfolio and internal processes to achieve an optimum managed security service. We will also showcase an overview of our Reference Architectures for a managed services environment which can be deployed in a number of different ways depending on what part of the solution is deployed onsite, what is deployed at the MSP, and what is serviced from the cloud. Attend this session to learn about the latest Complete Data Protection – Essential (CDE) suite, made available July 13, 2015. The new CDE suite will exist alongside the current CDA and CDB suites, making 3 choices available for your customers. To make data protection sales easy for you, the session will cover the key pain point areas most heard by IT and show how to best match your customer’s needs to one of the three data protection suites offered by Intel Security. The Intel Security Partner Managed Services Specialization provides innovative service delivery frameworks, which enable value-added partners to generate recurring revenue and to extend their business model from pure resale to services. Offer best-in-class Intel Security solutions and support directly to end users — all under your own services’ brand. Join this webinar for an overview of how three of McAfee’s technology solutions, including SIEM, Next Generation Firewall and Endpoint protection can be deployed in a managed services environment. These McAfee technology solutions can be deployed in a number of different ways depending on what part of the solution is deployed onsite, what is deployed at the MSP, and what is serviced from the cloud. We will review the solution architecture documents created for your reference as you explore these options within your organization. Help your customers secure their servers with the right migration plan! Take Advantage of the Opportunity with End of Service (EOS) for Microsoft Server 2003. During this webcast you will learn how to ensure your customers have proper protection for their server environment: on-premise, private cloud, or public cloud. Your customer will be looking to virtualize and when they do, they’ll need to protect virtual servers without impacting performance, which is where McAfee Server Security Suites with MOVE technology will help you transition your customers with confidence. Get the insight into how our comprehensive server security solutions will enable your customers to protect their intellectual property and be assured their data is safe and secure. Office 365 is taking the market by storm, creating a new opportunity for stronger security, starting with Email Protection. Join this webcast to learn about burning customer challenges, the opportunity, why Intel Security, and how you can get leverage the resources to help you drive sales. 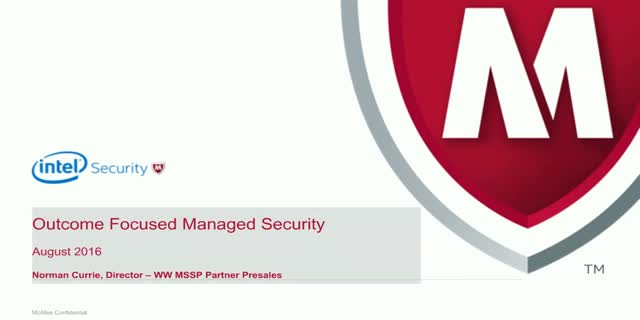 Take 15 minutes to learn about McAfee’s Management of Native Encryption (MNE) can help protect data on your customer’s Macs and Windows endpoints. MNE enables management of native encryption for Mac OS X (Apple FileVault) and the native encryption in Windows PCs, Laptops and Tablets (Microsoft BitLocker). With MNE, native encryption is managed directly from the single console ePolicy Orchestrator (ePO), just like other McAfee software. The updated MNE v3.0 has several User Interface enhancements and Workflow updates to make deployment even easier than before! Attend this webcast to learn about (1) what MNE is, (2) what you need to know about what Apple and Microsoft are telling your customers about Native Encryption, and (3) how to position the best practices for managing the native encryption for Macs (Apple FileVault) and for Windows based PCs (Microsoft BitLocker). The webinar will highlight functional aspects of McAfee Management of Native Encryption software available in four McAfee Endpoint Protection suites. The long-term lifeline for a large segment of today’s IT channel depends upon them cultivating a business that sells and delivers technology services on a recurring revenue basis. This webinar will review the highlights of CompTIA’s Trends in Managed Services Operations study. You will gain a better understanding of the key trends in the managed services provider space, including areas such as internal operations, software infrastructure selection and general business transformation. As a managed service provider your customers count on you to know their needs, recommend the right solutions, and keep things affordable. Your challenge is to find the most effective solutions that can be easily delivered as a managed service. McAfee® Endpoint Protection for SMB—a part of the Intel® Security product offering—contains the security performance and robust management of an endpoint product, in a solution that can be easily and cost-effectively rolled out and managed on-premises or through the cloud. Protecting devices, data and networks from modern threats does not have to be complex and costly. Trust McAfee to help you deliver simple, powerful endpoint protection exclusively for your small to midsize business customers. Learn more to capture this market opportunity. •Understand how to position it successfully against the competition. configuration, and administration of key McAfee products. Learn about the latest solution from McAfee that allows you to deliver a cohesive framework where security products collectively pinpoint threats and expose threat trends within your customers’ organization. McAfee Threat Intelligence Exchange significantly optimizes threat prevention, closing the gap from encounter to containment for advanced targeted attacks from days, weeks, and months down to milliseconds. Join our live interactive webcast as we discuss the sales strategies for McAfee Threat Intelligent Exchange; including how to qualify an opportunity, handle objections and counter the competition. Review selling scenarios and profitability programs available to drive your success. •Provide integration simplicity, through McAfee’s data exchange layer, reducing implementation and operational costs and enabling unmatched operational effectiveness. •Eliminate the gap between encounter to containment of advanced targeted attacks. Register Now to learn how to build on McAfee’s leadership experience across network, endpoint and data security with McAfee Threat Intelligence Exchange. Offer your customers the ability to quickly spot and pre-empt advanced threats with this key business differentiator as your customers seek to protect their intellectual property and be assured their data is safe and secure. We live in a dynamically changing threat environment, and Advanced Evasion Techniques (AETs) expose a fundamental design flaw in network security devices, despite vendors promising "100% protection." Creating highly targeted and sophisticated cyberattacks is resource-intensive for cybercriminals, so they often use AETs to disguise their attacks to gain network access and stay "under the radar." Over 800 million AETs exist today, and only McAfee can protect your customers. During this webcast, you'll learn how to easily test your customers' security against AETs with the McAfee Evader test lab. McAfee Evader is the most comprehensive evasion test available on the market today, and it can be used to test the effectiveness of network security devices from any security equipment vendor. This free, software–based tool enables you to launch controlled AET–borne attacks against your customers systems to assess how well your customers' existing network security devices stand up against AETs and then modify the evasions and combinations to see if an AET can get through. Informative sessions examining business best practices, McAfee technology solutions, as well as sales essentials — offering strategies to further your sales success and business growth.